So I've taken the Shave-moose concept a little further the past few days and would like to share some of the results. Primarily this has been the development of a working 3D model with more accurate dimensions and specifications, a rendered version of the model produced with Cinema 4D and an idea for the internal structure of the tool. 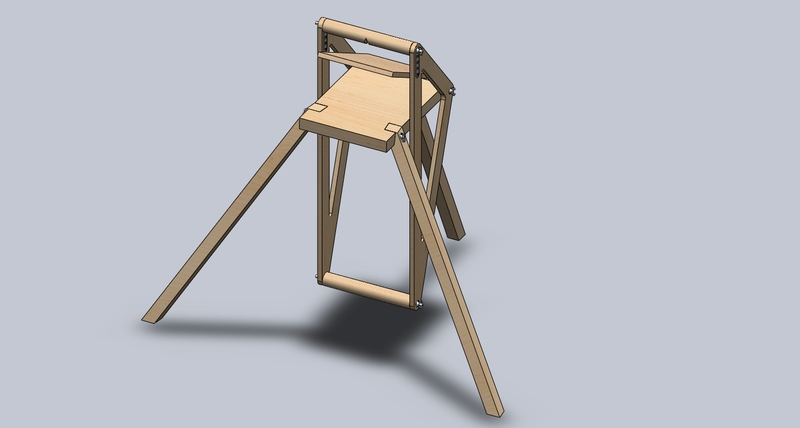 First off the Solidworks model. Below are three screenshots from the model produced. The angle of the front legs has been more defined with a 30° splay and a 15° forward bias. The rear leg maintains a 30° angle. I raised the top of the clamping arm to facilitate working on larger pieces. You can click on the images for a better view. Below is a partially exploded view of the leg joints. This shows in more detail the function of some of the washers and the shoulders that I suggested in the previous post for aligning the legs correctly. 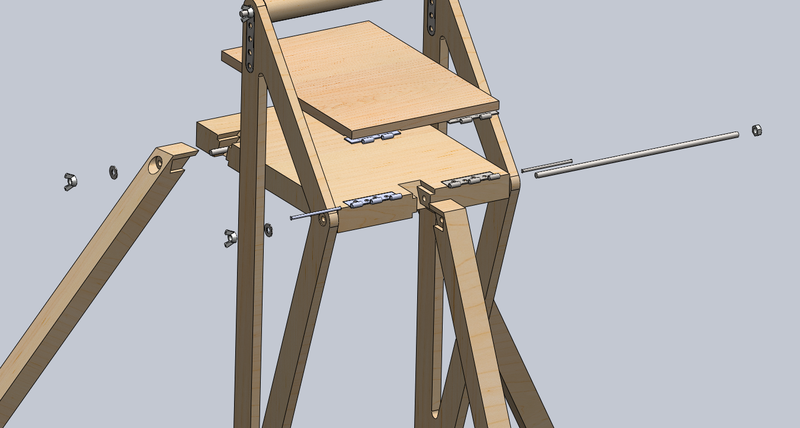 You may also notice the hinges added in this model for adjusting the angle of the stage. These are standard door hinges but have been recessed into both the flat base and the tilting stage so the stage can lie flat to avoid damage in transport. The next step was to render the model in Cinema 4D. While not entirely nessiscary it does produce some lovely images which are usually a little nicer for presentation of work than solidworks screen-captures. Again for much higher quality images you can click the previews below. Finally I again produced a simple exploded view of the front leg to show off the details of the joint. The final part of this post deals with an idea I had which arose out of the materials selection for the building of the shave-moose. Though ideally I would like to make it out of solid wood I have ordered a lot of plywood for the construction of the toolbox. I should have at least one sheet of plywood left over (barring any disasters) and this should be more than enough material to build the shave-moose. The plywood I ordered is in 9mm thick sheets however so the dimensions of the tool were modified such that the required thickness for the legs and flat base could be built up out of laminates of the plywood sheet. 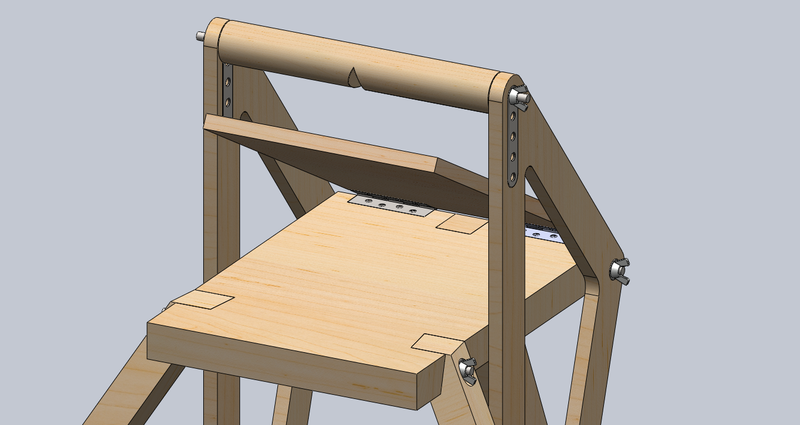 It occurred to me while adjusting the dimensions that using such a material while more cumbersome than using solid wood might have further advantages. As this is intended to be a portable too it would be a great advantage to be able to lower the weight in any way possible. If you consider that the flat base (45mm deep) would be made up of five 9mm plys then it might be possible to remove material from the centre three plys to reduce the overall weight of the tool. This could also be done in the legs to a smaller degree. While I think leaving an internal void would be a little too extreme and would be detrimental to the structure of the object something like a honeycomb could in fact increase the structural stability while still being light weight. 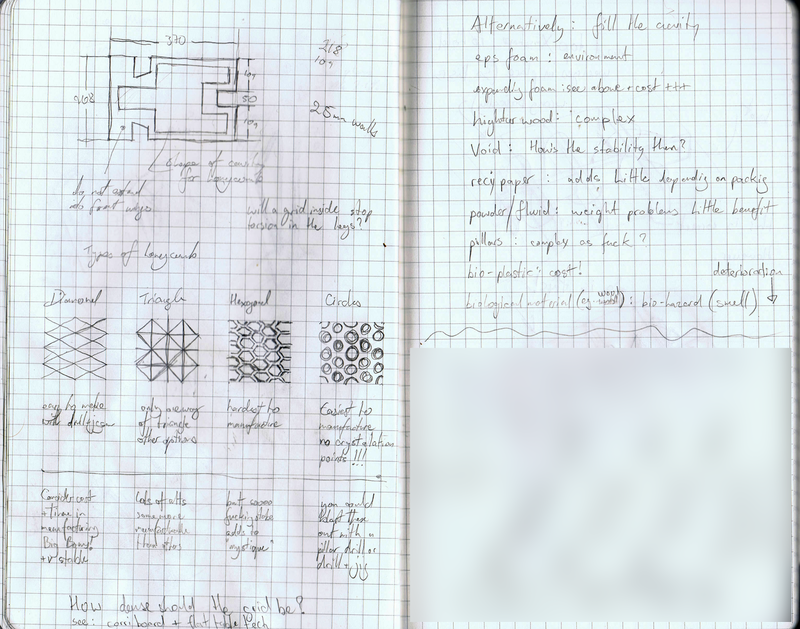 In the sketch below I considered what forms such a honeycomb could take and the potential drawbacks and advantages of each. I also thought about alternatives on the opposite page. The blurred section will appear in a later post (oooOOOoooh!). While this is far away from tested fact the next step would be to test these assumptions. Instead of building and testing the structures in reality which would use a lot of material and money I dont have the structures could be built in solidworks and tested using a method called finite element analysis or FEA for short. This process involves applying fixed points and simulated pressures on the 3D model with the material specified. Using this method you can test for potential deformation and failure of parts without the need for real-world destructive testing. I think this will be the next and hopefully final stage of the shave-moose development before I begin construction on both it and the toolbox. I'll post the results of these tests when I get around to doing them. In the nearer future expect more toolbox updates as promised in the previous post.